Patience With Private Practice Building is written by Contributing Author Liz Gray, LCSW, RPT. Jennie Mazza Jones, LCSW, RPT, CCPT went from being a therapist in a foster care program to building a private practice of her own. Today we are featuring Jennie’s career path and her journey to pursuing advanced training in Child Centered Play Therapy and the Body-Brain Approach to Sandtray Play Therapy. Learn how receiving practice building support from Lynn Louise Wonders helped Jennie reach her dream goals. As a foster care social worker, Jennie realized that if she was going to work with children, she needed to find the best approach to providing therapy to them. This led her to Child Centered Play Therapy (CCPT). She was hooked! Jennie became a Registered Play Therapist and also became certified in CCPT, diving deep into all things Child Centered and trauma related. Lynn Louise Wonders referred her to Rita Grayson’s sand tray training program and Jennie is now pursuing intensive training in the Body-Brain Approach to Sandtray Play Therapy. Jennie loves studying relational neuroscience and interpersonal neurobiology as she has realized this knowledge enhances her work as a play therapist in private practice. patience in private practice building! Jennie enrolled in practice building mentoring with Lynn Louise Wonders through a mastermind group and Lynn’s private monthly mentoring membership for therapists. When she first began working with Lynn she had a clear vision of her dream practice but she also had a lot of doubts it would ever come to fruition. She learned under Lynn’s guidance that steady action, persistence, focus and a lot of patience with private practice building were all essential to seeing her dream career actually manifest into reality. 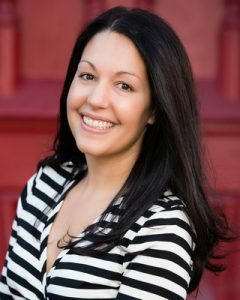 Jennie is the owner of Jennie Mazza Jones, LCSW, a private practice in Clinton, NY (right in the middle of New York State). In building a private practice, Jennie decided to work solely with children to help them navigate their struggles through Play Therapy. This helps them learn to relate differently to themselves and the world around them and show the parts of themselves that the adults who love them know is hiding underneath the fear, worry and disrespect. She pairs her work with consistent parent consultations, helping parents/caregivers who want to help the important children in their lives reach their truest potential by figuring out what is happening with their child. These meetings help solidify the work being done and provide support to the adults in the child’s life so they can relate to their child in a way that promotes that child’s unique needs and abilities. Jennie collaborates with other healing professionals to provide community education and workshops. She also rents out office space to other healing professionals that are in line with or compliment the work she does with clients. Jennie credits Lynn Louis Wonders and her business-building program in building a private practice. Jennie Mazza Jones, LCSW, RPT, CCPT is a New York State Licensed Clinical Social Worker, Registered Play Therapist and Certified Child Centered Play Therapist. She helps kids who long to feel accepted, want to do well, and wish they could control their worries, anger, and behaviors, but struggle because they communicate in a way that many adults don’t understand. Learn more at www.jenniemazzajones.com!